What has this dress not got!!? Usually I’m fairly strict on the amount of details we can put into one dress, more that 3 or 5 is overload (remember the monstrosity from the film Bridesmaids made by fictional Parisian Design Madame Jeju!?). But Jaclyn is a real life Carrie Bradshaw at heart, running her own fashion and lifestyle Blog Bumpkin Betty, so there were lots of style inspirations to consider. Jaclyn was initially torn between choosing a beautiful dusky pink or a more traditional ivory, so we did both. She was also torn between a long and elegant shape, and something more voluminous and swishy, so we did both! The only thing that was a certainty from the beginning was the cape! Instead of a veil Jaclyn wanted a long and flowing sheer cape in chiffon, that attached at the shoulders with a loose knotted chiffon tassel. As there was to be a change in looks, we decided to make a set of ‘wedding seperates’, a top, two skirts, each with a belt, and of course, the cape. The bodice was made in dusky pink satin and illusion tulle and layered with lots of different pieces of lace, Chantilly, Guipure, beaded, hand painted in shades of ivory and dusky pink, and further embellished with Swarovski crystals and pearls. The idea was that there was an almost off the shoulder look, but coupled with a low v-neck back, this could be prone to falling down (not a good look on your wedding day), so the decollete had a layer of ‘invisible’ tulle which is super fine and comes in many flesh tones, and the lace built up, growing into the desired neck-line shape, while maintaining support on the shoulders. The sleeves were also made in illusion tulle, with a lace trim at the cuffs, and a few sprigs of lace flowers scattered on the sleeve as though caught in a breeze. The ceremony skirt, I think, was a real show stopper, inspired my the sheer chiffon layers of Kate Moss’ wedding dress, the under layer had a dusky crepe fitted satin skirt mini-skirt (predominantly for modesty)with a zig-zag hem which we refered to as the pixie skirt to which the longer sheer under layer was attached, and the harder lines of the zig-zags softened with embroidered sprigs of lace. The over skirt was in a dusky pink chiffon, and cut slightly more flared than the under skirt for more dramatic effect. The train of the skirt was appliqued with hundreds of hand-cut chiffon petals, and hand-made silk flowers, also with a scattering of crystal beads. 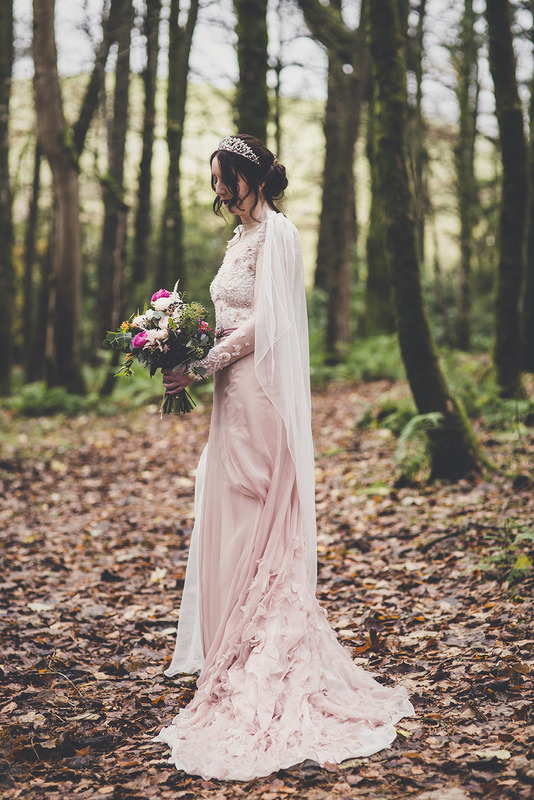 This first look was finished with a lace border applied at the hips a matching dusky pink velvet ribbon belt embellished with ribbon rose embroidery and beaded lace leaves. The second look was Jaclyn’s Carrie Bradshaw moment, a relatively simple skirt by comparison to the first at least. A Satin Organza circular skirt with a raised hem at the front and no train (highly suitable for dancing! ), lace leaves embroidered around the pockets and a deep velvet ribbon tied in a bow at the back. Jaclyn’s incredibly ethereal look was completed with an amazing tiara made from vintage pieces including oak leaves, a pink opal and matching swarovski crystals, it was made by Samantha Walden (here’s the website www.samanthawalden.co.uk). Oh, did you check out those pink/silver ombre Rupert Sanderson shoes too!!? And if you head to Jaclyn’s blog, you can search out her accessories changes into some funky silver boots, and a vintage silver leather jacket! There's a couple more images from after the wedding day too in my look book, when Jacchanged up her beauty look to be photographed by superstar photograph Jess Withey, check here.